The Refresher® Oasis™ is always a welcomed sight for your customers. With up to 500 cans capacity, the Oasis™ can deliver cold beverages all day. Customize the way you want. The FLEXSERVE™ FS2 and FS4 are engineered for flexibility. Innovative modules can be interchanged quickly to adapt easily to changing merchandising needs. FLEXSERVE™ helps to boost sales while offering a higher level of customer service. The FLEXSERVE™ Refresher® FS2™ or FS4™ is a welcomed site. With an award-winning design, the patented FS2™ and FS4™ help serve golfers quickly to enhance pace of play. The New Refresher Oasis is designed for properties that require a high volume of cold beverages, up to 500 cans. Display cases enhance overall merchandising. 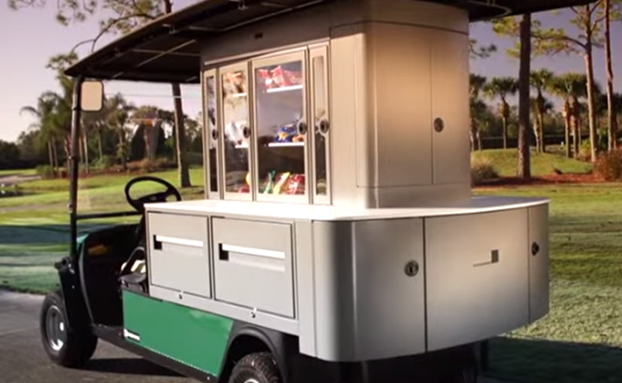 19th Hole Cart offers a complete range of refreshment centers to fit the unique demands of public courses, resorts or private properties. With capacities ranging from 200 to 500 cans and modular merchandising, we have a refreshment center that will best serve your clients. 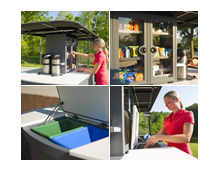 Only 19th Hole Cart's refreshment centers are customizable to your changing needs. Our patented FLEXSERVE™ FS2 and FS4 allow modules to be changed easily and quickly, giving better sales momentum throughout the day. We specialize in custom projects, please contact us. 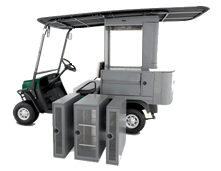 Our award winning FS2™ and FS4™ modules, drawers and exclusive end cap bar allow you to customize your cart to fit the exact needs of the days' events. Offer your customers more variety to maximize sales. Innovative designs include a large U-shaped countertop, end cap coffee/bar service, changeable display modules including a Beer Keg module and Foodwarmer, & frozen drawers - all help you deliver the best service to your clients. We purchased a second Refresher FS2 model for use at our resort. Sales has about doubled and our customers love the service. We will recommend your products to all of our friends. We've seen a rise in revenue by about 30% just by using the countertop to display drinks and food. 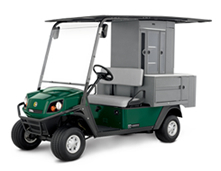 Our members quickly accepted the new cart and we like its premium image. We purchased the Refresher FS4 model a few month's ago and it has literally transformed our food and beverage service. Customers can now have a cold beer or soft drink without having to walk to one of our consession stands. It's the best purchase we've ever made! © 2016 19th Hole Cart, LLC. All Rights Reserved.